If you’re like most people who earn an income, everything you own today, including your home, car, boat, and even the food on your table, depends on your ability to bring home your paycheck. It’s what makes your lifestyle possible. 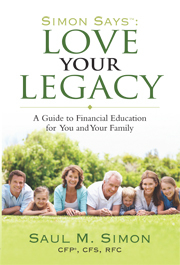 When you think about it, your ability to earn money, both for yourself and your heirs, is your most important asset. What would happen if this asset were compromised? If you were unable to earn your expected income because you got sick or had an accident? While most people have health insurance to pay their medical bills, car insurance for their car, homeowner’s insurance for their home—the list goes on—too many people overlook insuring the one thing that pays for everything else: their income. This is a subject with which I have personal experience. Years ago while crossing the street I was hit by a car. My leg was broken in three places and I was almost totally disabled for eight months. I didn’t have disability insurance then; I had always figured that, even if I were physically disabled, I would still be able to talk with my clients and conduct my business by telephone, so I could carry on pretty much as usual. But it was very difficult to conduct “business as usual” with my injuries, and I bought disability insurance for myself as soon as I was able to do so. Then I wouldn’t have to worry about working and paying the bills for my home and family if I were to become disabled again. The accident was a scary experience, and one that I had no idea was coming. One moment everything was fine and the next moment I was in the hospital. My life changed in an instant. Fortunately I recovered, but it taught me a lesson: Be prepared! Protecting your income with disability insurance would be a very wise decision. Disability insurance can help replace a major portion of your income when you are sick or injured and unable to work. Some people think of it as “paycheck protection.” Since a mortgage payment is often a family’s most significant monthly expense, others view it as a way to protect their home. The risk is real—statistics say that that if you’re at the age forty, prior to reaching age sixty-five you have a 43% chance of becoming disabled for ninety days or more. Your savings. If you have saved ten percent of your income each year, one year of total disability could wipe out ten years of savings. Could you afford that? Employer coverage. If you became disabled, do you know how much your employer or business would continue to pay you, and for how long? Working spouse or partner. If you have a spouse or partner who works—or could work—could he or she earn enough to support the household while possibly also being your caretaker? Social Security. If you become disabled, the federal government won’t immediately come to your rescue. As of this writing, you cannot collect benefits until the end of the fifth full calendar month of total disability, and then only if it is expected to last twelve months or more. Could you wait six months for payment? What would you do if your disability doesn’t meet federal requirements? Selling investments and assets. Will selling stocks or other assets under forced conditions bring a true value? What will their value be at the time you are disabled? Obtaining a loan. Without an income, will you be able to borrow money? Most financial planners and insurance agents have easy-to-use needs assessment calculators to help you determine how much coverage you need. You simply plug in the numbers and then decide how much coverage you need and for how long. Most insurance companies offer short-term and long-term disability insurance. Both types of policies are designed to pay you a monthly benefit if you are unable to work due to a disabling accident or sickness. The definition of “disability” and the conditions under which you can collect benefits will differ depending on the policy and state. Here are the typical features of each. Short Term Disability (STD). This type of insurance policy is useful for major but relatively brief disabilities such as those suffered from an accident or a non-terminal sickness. They pay benefits after a pre-determined “elimination period” has been met. (This is the number of calendar days after a disabling injury or onset of illness before your disability insurance policy begins to pay benefits). A short-term policy may be right for you if want immediate coverage from the first day of your disability, you only need coverage until your employer-provided disability insurance would begin paying benefits, and you are willing to accept a shorter benefit period to keep the premium as low as possible. You can customize this policy by selecting the elimination period, benefit period, and optional riders that would best meet your needs. You can buy additional options, such as lump-sum benefits for certain critical illnesses, a lump sum payment to your beneficiaries if you die while covered, payments if you’re hospitalized, and many more. Long Term Disability (LTD). As the name implies, these insurance policies provide comprehensive long-term benefits that will cover you in the event of accident and sickness, with a benefit period ranging from two years or until retirement age. Because each state has its own regulations governing the length and availability of long-term (and short-term) disability insurance, it is important to talk with a licensed insurance agent in your area to determine possible time frames. Long-term disability insurance may be right for you if you have resources that could cover your living expenses for the first few months of a disability, you want long-term benefits that would cover disability from an accident or sickness, or you’re interested in protection that is portable throughout several years of your career, even up to retirement age. Many employers offer disability income insurance as part of their employee benefits program. If your employer pays the premium, you will pay tax on any disability benefits you receive. Even if you have employer-provided disability insurance, you may want to supplement it with an individual policy. While a personal disability insurance policy can protect you if you cannot work, if you own a business it will likely not provide a large enough benefit to keep your business solvent as well. Most insurance companies offer business overhead expense (BOE) insurance to help small business owners maintain their business in the event of sickness or disability. The Social Security and Supplemental Security Income disability programs are the largest of several federal programs that provide assistance to people with disabilities. While these two programs are different in many ways, both are administered by the Social Security Administration, and only individuals who have a disability and meet medical criteria may qualify for benefits under either program. No matter your circumstances, it’s a smart move to investigate disability insurance. You never know when an accident might happen. You can’t eliminate risk by hiding at home, which is why it pays to be prudent and take the necessary steps to plan for the unexpected. Accidents and illnesses happen to everyone at some time in their life; the key is to not let a negative incident wipe out your finances. For families caring for a loved one with a disability, special needs trusts—also called supplemental needs trusts—can provide peace of mind. Special needs trusts allow the family to improve the quality of life for the loved one without jeopardizing eligibility for government benefits including Supplemental Security Income (SSI), Medicaid benefits, vocational rehabilitation, subsidized housing, and other benefits based upon need. Many people make the mistake of leaving assets to their disabled loved ones through a will. This is problematic because acquiring assets, such as a lump sum of money, can disqualify your loved one for these types of government assistance programs. By setting up a special needs trust, instead of solely using a will, you can avoid these issues; and in addition to benefitting from the wealth held by the trust, your heir may be able to continue to collect government benefits. If your heir or loved one lacks the legal capacity to handle his or her own financial affairs, there can be administrative advantages of using a trust to hold and manage property intended for the benefit of the beneficiary. In addition to being funded by a parent, special needs trusts are frequently used to receive an inheritance or personal injury settlement proceeds on behalf of a person with disability, or are founded from the proceeds of compensation for insurance settlements, litigation, or criminal injuries. When creating the trust, you need to choose someone to serve as trustee who will have complete discretion over the trust property and will be in charge of spending money on your loved one’s behalf. The trustee can be a family member or, if an appropriate and trustworthy family member is unavailable, a third party will be appointed by the court. Because your heir will have no control over the trust or its assets, for program eligibility purposes SSI and Medicaid administrators will ignore the trust property. In addition, if the beneficiary is ever sued, the funds in his or her special needs trust cannot be touched, as they are not subject to any judgment. A special needs trust is much safer than the antiquated practice of “disinheritance,” which was a means of providing for a disabled or ill person by putting all of his or her assets in the custody of a relative or sibling. A non-disabled third party holding assets for the benefit of a disabled sibling could be subject to liabilities such as judgments from automobile accidents, a bankruptcy, or a divorce. Even if you and your family are not interested in government benefits, you should still consider a special needs trust to address those specific needs. Furthermore, you never know what the future holds. There is no sense in sacrificing government services that could be beneficial for your disabled loved one in the future. But if you’re certain you don’t need to worry about government support, you can set up a “general support” special needs trust designed to serve as the primary or sole source of benefits for the beneficiary. The special needs trust ends when it is no longer needed—most commonly at the beneficiary’s death or when the trust funds have all been spent. According to the law, a special needs trust can be used for “supplemental and extra care over and above what the government provides.” The trustee cannot give money directly to your heir, because that would interfere with his or her eligibility for SSI and Medicaid. But the trustee can spend trust assets to buy a wide variety of goods and services for your loved one. Special needs trust funds are commonly used to pay for personal care attendants, vacations, home furnishings, out-of-pocket medical and dental expenses, education, recreation, vehicles, and physical rehabilitation. Although there are Medicaid rules that say that the trust cannot be used for housing or food without risking loss of Medicaid benefits, these rules have to be interpreted carefully. For example, there is no restriction on having the trust purchase an accessible home or making accessibility adaptations to an existing home. Likewise, although everyday foodstuffs are not strictly allowable under the rules, social events such as dinner parties are; likewise, entertainment and vacations are permitted. When in doubt, you should check with your qualified financial advisor or lawyer to determine what expenditures are allowed. If the trustee of a special needs trust pays for the beneficiary’s food or shelter, the amount paid is considered income to the beneficiary. Specifically, it’s called in-kind income or in-kind support and maintenance (ISM). The SSI program treats ISM differently from other types of income. Pooled trusts are a type of special needs trust managed by nonprofit organizations. The controlling organization pools the money from multiple clients and invests it. Each beneficiary still has his or her own separate account and his or her own trustee, chosen by the nonprofit organization. The appointed trustee purchases items for the beneficiary, just like a trustee appointed by the family or the court would. If you are having difficulty identifying someone who would be a good fit as a trustee, a pooled trust may be an appropriate solution. Special needs trusts should be set up under the guidance of a structured settlement planner in cooperation with a qualified legal and financial team to ensure the trust is set up correctly. The trust documents should state that it is intended to provide “supplemental and extra care” over and above that which the government provides. The trust must state that it is not intended to be a basic support trust, and should not contain an estate tax provision called a Crummey clause. A properly drafted trust will address the issue concerning paybacks to Medicaid or other such sources. The United States Congress mandates that repayment language must be included in all special needs trusts, whether repayment is required or not. A poorly written special needs trust can cause a loss of benefits, a loss of savings, or other financial and legal hardships for the beneficiary or the trustee. If you wish to pass benefits to an heir or loved one with a disability or chronic illness, you would be well advised to utilize the services of an attorney who specializes in trusts and other financial issues pertaining to those with special needs. If you’re caring for someone with a disability, a special needs trust—also called a supplemental needs trust—can provide a sensible solution. Rather than leaving assets to your disabled loved one through a will, a special needs trusts allows you to improve the quality of life for your loved one without jeopardizing eligibility for government benefits including Supplemental Security Income (SSI), Medicaid benefits, vocational rehabilitation, subsidized housing, and other benefits based upon need.